Hello students of Medieval Metaphysics! 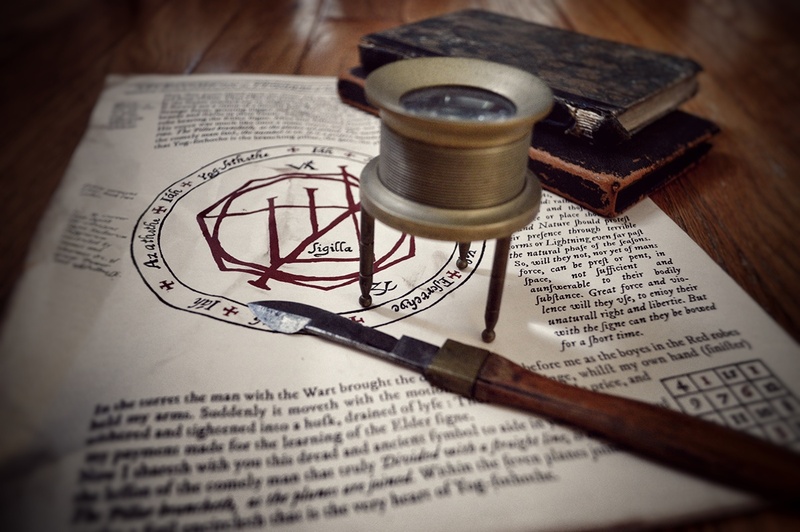 I have a goal and a vision: to create an 800 page faithful imagining of John Dee's English translation of the Necronomicon, with woodcuts and diagrams throughout. Over the last ten years I have created hundreds of images in preparation for this launch, but that was only the first step. Now I will create the text to flesh out the book. I am writing the book in authentic Elizabethan English and presenting it as it would have looked straight from the printers press. Notes in Latin and Greek (as well as numerous codes) will add to the authenticity. But here is where Patreon comes into play: I want you to have the Necronomicon too. For my Patrons I will produce one 11"x17" double-sided leaf each month (when folded in half this creates four pages). Each leaf will be individually aged and folded for you. These leaves can then be nested to create a quire, amounting to 48 pages in a year. Seventeen quires will make the finished codex. But it gets better: if I can reach 100 Patrons I will DOUBLE my output for the same base rate. Two leaves a month, making 2 quires a year, equaling 96 pages! So helping spread the word of this project benefits everyone! For those joining later all previous pages will be available for the base price each (price depending on your location). This way Patrons can begin at any time, without feeling like they missed the opportunity. I will offer a new leaf at the start of each month. The next mailing will be Leaf 017 and Leaf 018. There will be special pages utilizing all aspects of 17th century innovation and I will give tips and guides here on how best to orient them in your ever-growing Necronomicon. This will be a massive undertaking, but also a really fun project. I am committed to seeing this through as I want to own this book. I want to create the book I imagine Wilbur Whateley or Joseph Curwen owning. And I want you to own it too! My name is Christian, I live in Maine in the U.S., and I've been an H.P. Lovecraft fan since the mid-Ninties. As a Freshman in college I started the Propping Up the Mythos website* as a way to encourage other fans to build objects from HPL's stories. My first Lovecraftian short film adaptation Nyarlathotep won the Katahdin Award at the Maine International Film Festival, and my original Mythos film Experiment 17 won the Brown Jenkin Award at the H.P. Lovecraft Film Festival. I also adapted a chapter of Herbert West Re-Animator (as An Imperfect Solution) and made a prequel to the Dunwich Horror. My films have been released on DVD by Lurker Films as well as Arkham Bazaar's "Classics Vol. 2" (http://www.arkhambazaar.com ). You are in charge of the rare book room, don't lose the keys! This is for Patrons inside the U.S. Though oceans may separate us, the Call of Cthulhu reaches all our dreams equally. The price bump is just to cover added shipping and handling for Patrons outside the U.S. When I reach 100 Patrons, I will double my output: two double-sided sheets per month, equaling 96 pages a year!